DISTILLATE? HYDROSOL? FLOWER WATER, FLORAL WATER, ESSENTIAL WATER?? It is important to stress that I am speaking of honest to goodness, steam distilled, whole plant distillates. They are also correctly called hydrosol Waters. For thousands of years these healing waters have been crafted by collecting the steam rising off a pot of boiling water in which leaves, flowers, roots, needles, bark and such are stewing. Today modern stills function much the same way. Flower water, floral water, essential water, these may or not be an authentic hydrosols and are produced in various ways other than steam distillation. In traditional hydrosol water steam distillation, fresh plant material is packed into a still, steam rises through the leaves and blossoms, their cells burst open and the plant chemicals are released into the steam. When the steam condenses this water is collected. It is now enriched with the compounds including microscopic particles of the plants essential oils. HARD WATER? Most all of us are bathing in it and that spells potential trouble for our skin. Unless you add a water softer to your system, then you are bathing in it. Water is deemed hard when it has high levels of dissolved minerals. This shifts the Ph of the water towards slight basic ... bad news for your skin. Our skin needs to be in a slightly acidic state to maintain a strong acid mantle. An impaired barrier can lead to skin disorders such as rosacea, dermatitis, itch and outbreaks. I wrote about this in more detail HERE. The health of the acid mantle is a vital but often over overlooked aspect of healthy skin. Use daily after bathing, Hydrosol water gently and quickly restores the right Ph. Gentle Cleansing. With one of the methods for oil cleansing you apply the oil to dry skin, then add a little water while you rub it all in. Hydrosols can be used as the water component to enhance this method. Spritz your face after applying the oils, massage together on your skin, wipe, then rinse with plain warm water. Pat dry, follow up with another spritz, then facial oils. Facial Oils & Hydrosol Water. Spritzing with hydrosol water is especially beneficial prior to applying facial oils. 100% facial treatment oils are not "moisturizers" per se. They help your skin in lots of way but they have no water - so no moisture, so they don't hydrate! Instead they nourish and condition the skin, helping it stay supple and strong so it can RETAIN moisture. You can transform facial oils into a totally awesome, natural, simple, POWERFUL "hydrating moisturizer" by simply spritzing with a hydrosol, then massaging in your facial oils and allowing your face to air dry. Rose hydrosol is top on my list. The scent is truly intoxicating. It possess a complex chemical profile with more than 275 plant compounds identified. 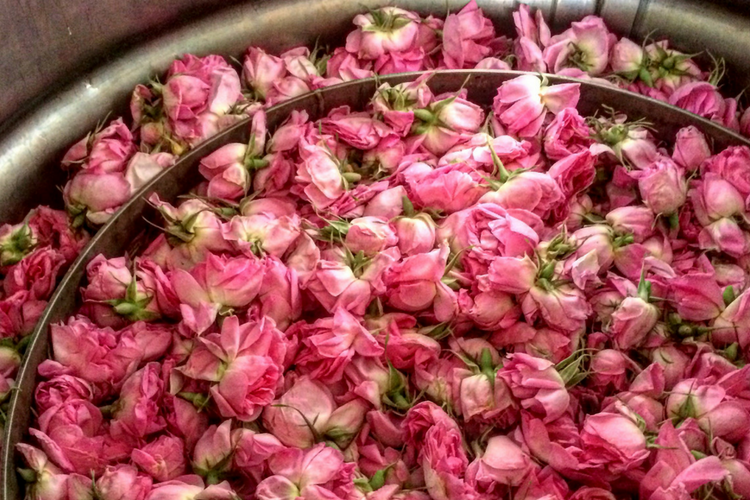 Rose hydrosol is deeply nourishing and has been used for thousands of year to restores skin's radiance, beauty and youthfulness. Beyond skincare, the number of therapeutic uses of this amazing water is truly amazing. Roses contain phenolic compound. Phenolics possess a wide range of biological activitie, including anti-oxidatant functions, free-radical scavenging, anticancer, anti-inflammatory, anti-mutagenic (helps prevent damage to DNA), and antidepressant. Restore & Balance Skin Ph. Rose hydrosol provides slightly acidic moisture, helping to balance and restore the acid mantle. Stimulates the Skin. Shown to Increase blood flow to the skin's surface, improving a wide range of skin functions. For all skin types: Rose hydrosol controls and balances sebum production. It is loved by all, even those with acneic skin. Soothes Irritation and Calm Inflammation. Rosacea, dermatitis and eczema, acne - all benefit from daily use and has been used to calm the skin for thousands of years. Mild Astringent. Something that is astringent on the skin causes the pores to close and skin to draw together. Visually reducing the size of large pores and helping them keep them clean and free of debris. Reduces the appearance of fine lines and wrinkles. The astringency draws skin tissue together, helping make lines in the skin less apparent. Antimicrobial. Pathogenic viruses, mold, yeast, fungus, bacteria are all vulnerable to the Rose Hydrosols antimicrobial chemical compounds. Especially those that cause acne. Uplifts the Mind and Mood: The scent of roses lifts the mood, reduces feelings of anger, soothes the agitated mind and unsettled emotions, nourishes the heart, enlivens the spirit, and stimulates feelings of well-being and happiness. Join me next time when I write about Immortelle Hydrosol.